To go along with the new Warmonger Halloween Limited Edition on Kickstarter, I’ve made 4 new Robots. You can download them for free as a pdf right now! 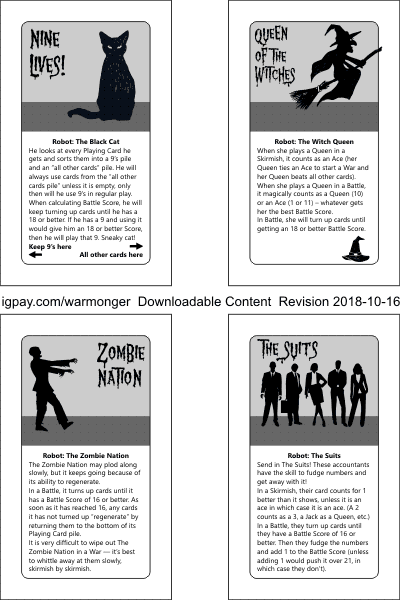 And be sure to check out the Warmonger Halloween Kickstarter campaign to get your own copy of Warmonger (in original Pack-of-Death Edition, USA Edition, or Halloween Edition). Hi! 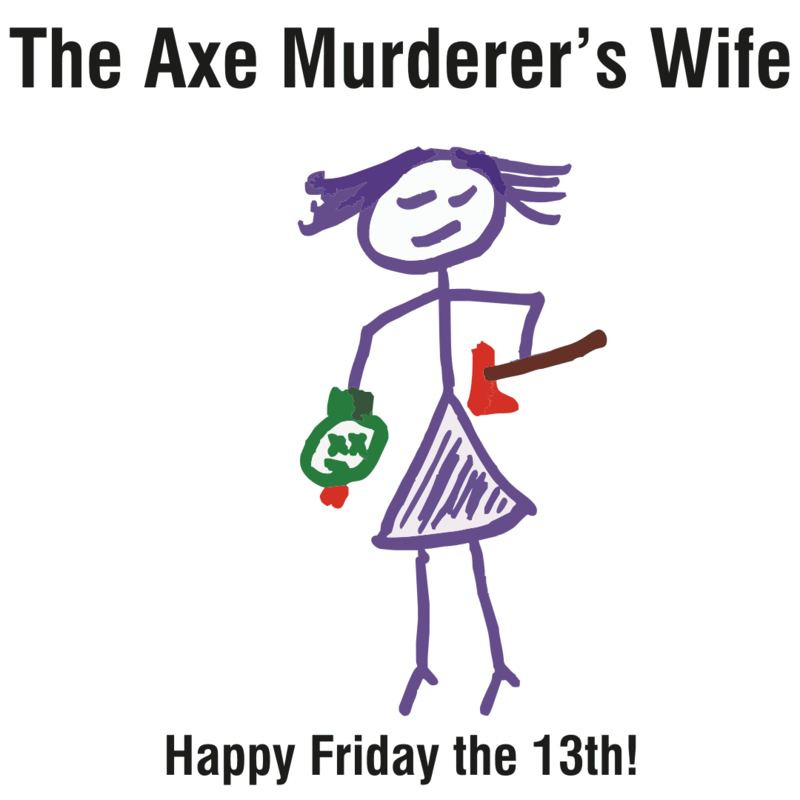 Things are going great here and I want to wish you a happy (and safe) Friday the 13th! I’ve got a new ad spot video for Dysfunctional Families – just under 1 minute 30 seconds. Please check it out and share it around. We’re almost at $900 — which is amazing! I think that at $1000 I’m going to have to come up with something special to celebrate! Talk to you more on Monday! Have a great weekend! This post originally appeared as a Dysfunctional Families backer update here. Read moreSmall Tweaks Improve The Game Even More! I received an excellent question from a backer and I am posting the answer as a backer update and also posting it here on the blog. Is the funding goal really only $13? 2. Because it IS technically possible. 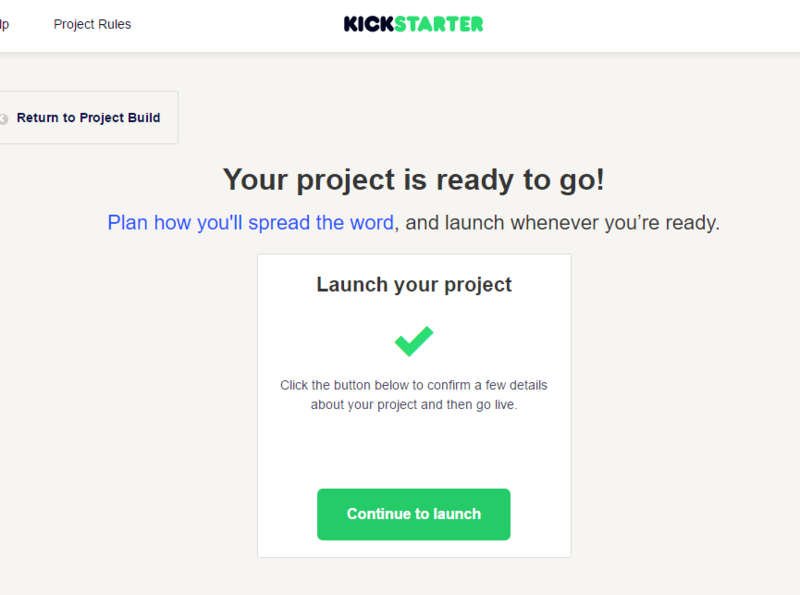 Read moreKickstarter – What happens when you press the “Continue to launch” BIG GREEN BUTTON? Between my first attempt to launch Dysfunctional Families on Kickstarter and now, there has been an exciting new advancement in card game printing. DriveThruCards has started offering tuckboxes on single orders of a deck of cards. They are now my #1 choice for Quantity One (the ability to produce ONE end product for a customer) card game production. This post will describe how I set up Dysfunctional Families as a QTYONE project and will fill in some broad strokes of what would be success levels beyond the minimum and how the project can scale up to a traditional publishing model if it sufficiently successful. Feel free to use this as a model for setting up your own card game projects and to ask questions below. Improv (as I’ve learned it) is taught by learning various games, where each game develops a certain skill. Eventually one builds a repertoire of skills and is able to combine a bunch of them and so some impressive stuff. What I also like about the “Because I said so!” game is that if someone asks you about improv, it’s fairly easy to explain the game to them and get them up and running DOING some improv so that they can get a feel for it. Read moreMy Favorite Improv Game: Because I Said So! I’ve written about the importance of improv in daily life. The way one gets better at improv and having an “improv outlook” to life is to practice it in various ways throughout the day. Which leads to the design of my first game, Dysfunctional Families. pre-written on the cards. So I created Dysfunctional Families.